* browse files. directories with very large numbers of files might cause the camera to run out of memory, we really need an alternative to os.listdir that lets you iterate over a directory instead of dumping the whole thing into a table. - and a bunch of useful supporting code: listdir shows how the ptp message stuff is intended to be used, serialize/unserialize makes passing values between lua and pc super easy. This is a very sophisticated work - respect. My first test was successful. With installed Lua for Windows it's easy to start the GUI. The camera functions are working properly. 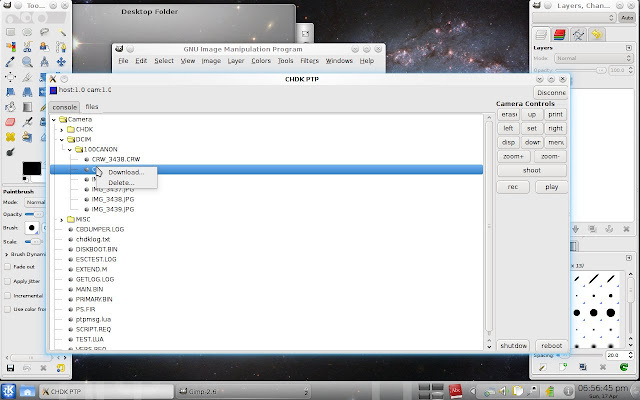 The file browser represents a new quality of ptp communication. The connection between computer and camera is fast and stable. My first test was successful. With installed Lua for Windows it's easy to start the GUI. Not sure if I'm understand, if you mean http://code.google.com/p/luaforwindows/ it's not needed. If you want to compile, then you need IUP and lua libraries to link to. Yes, this was my mistake. I've tested some iup sample scripts with Lua for Windows. The client works without this installation. With protocol version 2, we now have a pretty much transparent remote procedure call from lua. chdku.exec with the appropriate options returns a status, plus the camera functions return values, e.g. Will Revision 36 work with A570? If so is there any docs? Especially what is working and what is Not. Checked http://www.assembla.com/spaces/chdkptp/documents but was unable to get details. Also status of project and next release? The executable hasn't changed, so you can just replace the .lua files. The "milestones" are just to organize order and priority, just because something appears in "alpha 1" doesn't mean there will be an "alpha 1" release with those things in it. There is no schedule, my time to work on personal projects is limited and unpredictable right now. Checked all the links and the only way I can help at present is to test if works on my A570. Since you are the chief developer of chdkptp is there any advantage of using CHDKDE instead of the standard CHDK? Also is it possible to be notified when the GUI becomes usable? Question: every time I turn off my A570 the Drive mode changes back to single from continuous. Is there any way CHDK, CHDKDE or CHDKPTP can change the default drive mode from single to continuous? Some additional functions are available in chdkde lua. If you need them, then it's an advantage. This isn't specific to use with PTP clients like chdkptp. I will certainly post here. Not conveniently as far as I know. You can script button presses, so you could switch it to continuous mode by pressing func set etc. You can have a script run at startup, but this means you can't have another script selected. Also, it would only work in record mode, and might have trouble if the canon firmware remembers the position in the menu. At some point it would be nice to make some "autoexec" scripts that run on certain events, like startup or switching between rec and play. This is all off-topic for chdkptp, since it isn't specific to USB. I'm sure this problem with continuous mode has been discussed many times on the forum.